We’re serious lookers right now. The Mets look serious. Their performance to date has been bolstered by unexpected (and in one case unprecedented) levels of excellence from their three biggest stars, David Wright, Johan Santana and R.A. Dickey. You know that. They’ve benefited from some timely hitting and, outside of the injury to Mike Pelfrey, health in their starting rotation. Some complementary players have overperformed, and plenty of regulars have underperformed. It’s a half season of baseball, and that’s how half seasons of baseball go. Probably Jordany Valdespin won’t maintain an .826 OPS and Ike Davis won’t hit .201 all year. The bullpen stinks and the lineup is extremely susceptible to good left-handed pitching. Since a massive overhaul is unlikely, the Mets will remain in contention or fall out of it on the performances of guys already on the club. 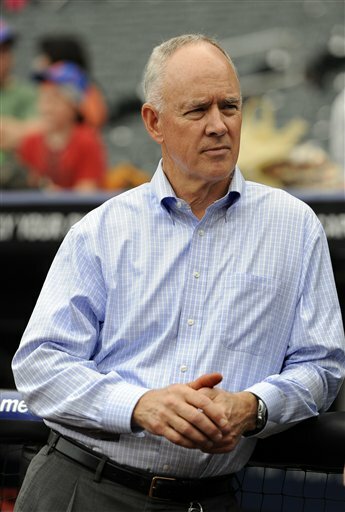 But since — as we know — pennant and Wild Card races often come down to one game, Sandy Alderson and the SABRos should be seriously looking for some relief help and an offensive upgrade against lefties. The next three weeks will bring the typical tsunami of trade-deadline nonsense, with sources spewing substance and silliness, and trades proposed, executed, celebrated and lamented on Twitter without ever actually happening in real life. It’s how it is, and, when your team is in contention and its GM appears competent, it’s pretty damn fun. Hell yeah the Mets should get Ramon Hernandez if all it takes is money. And bring on K-Rod, while they’re at it. Here’s the thing, though: The Mets’ biggest additions might be guys they already have. As Alderson points out in the interview above, Jason Bay’s return gives the team a right-handed bat that can hit lefties. Bay shouldn’t be playing every day at this point because he can’t hit righties, but lord knows they’ve got lefty-hitting outfielders to play against righties. Bay’s return gives Terry Collins more flexibility with his outfield rotation, and, if and when an opponent calls on a LOOGY for a stretch of lefty hitters in the lineup, a righty bat to counteract. And in the bullpen, the Mets’ best help might be the mean. Neither Ramon Ramirez nor Frank Francisco has ever been nearly as bad as they have been in the first half of this season, and both have suffered from atypically high batting averages on balls in play. It’s understandable to want a shakeup for the sake of it, just to not watch the usual suspects pitch out of the bullpen anymore. But given the amount of fluctuation inherent in small-sample relief performances, it seems about as likely that Ramirez and Francisco will pitch like they did last year as someone brought in from outside will continue pitching like he is this year. There’s room for seven in the bullpen, though, and the Mets could certainly use a second lefty and some improvement around the fringes. I’m just not sure it’s worth giving up prospects for, especially when some of those prospects might make the difference themselves. I’ve lost the point. Here it is: If the Mets’ best players keep producing like they have, their rotation stays healthy and some of their struggling regulars start playing like they have in the past, the team should be competitive no matter how it manages its margins. If David Wright slumps for the whole second half, Ike Davis doesn’t improve and a starting pitcher or two fall to injury, it won’t really matter if they’ve added a better-hitting righty backup catcher or not. But they have way too many middle infielders on the roster and a couple of areas where they could improve, so it does seem like there should be some action.